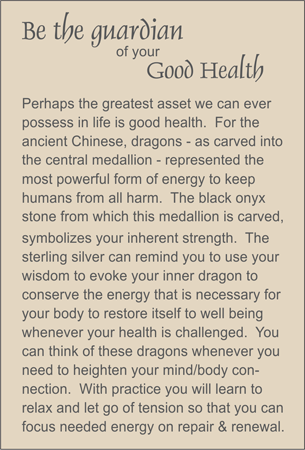 The importance of good health is portrayed by the black onyx medallion which depicts two dragons, the most powerful form of energy for the ancient Chinese. Smooth ocean jasper tumbled nuggets form the body of the necklace and are punctuated by black onyx waveforms and trios of black onyx rondelles and faceted quartz crystal. Sterling silver spring clasp.